This scuba diving trip in Bali takes you to the dive sites around Gili Mimpang and Gili Tepekong that are exclusively available for certified Advanced Open Water Divers with a minimum of 25 logged dives. These dive sites usually have unpredictable water currents, but divers are rewarded with a shark cave filled with White-tip reef sharks, and if you're lucky, you may even spot the Mola Mola fish during the months of Jun-Oct. In a single day, you will complete two dives; one at Gili Mimpang and the other at Gili Tepekong. You will dive as deep as 30 meters/100 feet in the clear water of the Bali sea with excellent underwater visibility to spot brightly coloured marine life. Please note that divers with an AOWD certification but without the prerequisite logged dives will not be allowed to participate in this scuba diving trip to Gili Mimpang and Tepekong. Gili Mimpang and Gili Tepekong dive sites are located just a few minutes boat ride away from Padang Bai port. Gili Mimpang features a unique topography with large and small rock formations, and deep drop-offs. The dive site is famous for spotting the Mola Mola cleaning stations, where Mola Mola fish come from the depths of ocean to get their skin cleaned by tiny fish. Although located near Gili Mimpang, Tepekong is a totally different dive site featuring different topography. Tepekong dive site has a shark cave where the White-tip reef shark can often be seen. The visibility underwater is clear and you will be amazed by the sight of different fish and vivid corals. • Swim through the unique topography of large and small rocks. • Spot White-tip reef sharks and huge Mola Mola fishes. 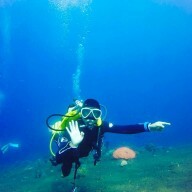 • Enjoy diving in excellent visibility conditions to spot exotic marine life. Go scuba diving in Gili Mimpang and Tepekong, Bali! Your pick-up will arrive to take you to the dive centre in the morning. You'll be heading on a short drive to the dive centre in Sanur, where you'll have a briefing session with your dive instructor. You'll then continue your journey to Gili Mimpang on a boat. Over the course of the day, you will complete 2 dives, in the strong water currents at Gili Mimpang and Tepekong dive sites. You'll see White-tip reef sharks, Mola Mola fishes and vivid corals. An appetizing lunch with snacks will be served in between your dives on your boat. You'll reach the dive centre in Sanur by late afternoon. Your trip ends here. A pick-up and drop-off is offered between the hotel and your dive centre. Please inform the tour operator the exact address of your hotel or place of accommodation before your trip. Lunch is served between the two dives.